From builders boards to shop fronts and pavement signs, we can design and manufacture signs to get you noticed. Fascia Signs can be created in a variety of ways, including flat panels decorated with vinyl graphics or digital print, fabricated letters and logos, or illuminated box signs. As well as more traditional internal illuminated box signs there is also now LED based technologies which offer outstanding illumination and enhanced performance. 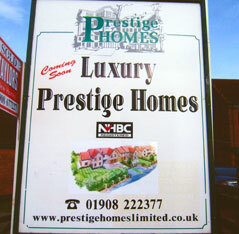 This is something we have been involved with for many years, specializing particularly in Exchange Rate Board fascias. 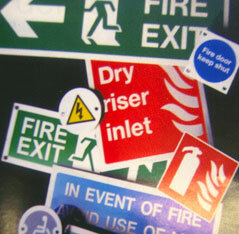 Safety Signs We can supply virtually any type of safety sign for any type of situation. Our safety signs are available in a variety of sizes, materials and fixing options. As an employer you are now required to provide and maintain safety signs wherever any risks to Health and Safety have not been avoided in any other means. Directional Signs Good signage provides a very important role when people are moving around unfamiliar places, which could be an office, building site, train station, hospital or even your own work place. They are visually faced with the challenge of having to locate a specific destination, which involves complex decisions and problem solving processes. These problems are significantly reduced with well planned, clear, east-to-read signage in place. Pavement Signs Advertise your business or event with a free standing A sign. We offer many different designs of boards depending on your taste and budget. Mostly letterhead double sided - A boards/signs offer a cost effective way to display your message. Banners have been hugely popular for many generations. Their versatility and ease of use have placed them as a firm favourite within the sign and display family of products. 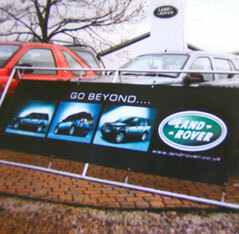 Contemporary banners are manufactured from sturdy materials and can be decorated with computer cut vinyl graphics or full colour digital prints. The application of banners is as far reaching as your imagination. Hang them from display stands, suspend them from walls or ceilings, tension-fit them on posts, drop them from the sides of buildings. 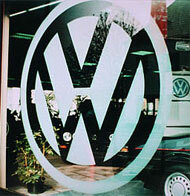 Banners offer a superb means of promotion for the short term as well as a classic method of permanent signage. To enhance both external and internal glass, we can apply a variety of frosted, clear and full colour bespoke graphic films advertising your company's identity and services. If more obscurity is required, full coverage frosted vinyl can be applied.